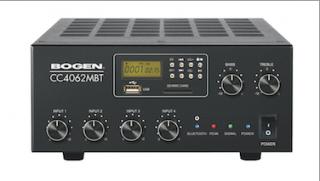 The What: Bogen's new Model CC4062MBT is the latest model in the CC-Series of amplifiers which are 40-watt compact amplifiers with varying inputs and features.The What Else: The new CC4062MBT provides seven inputs (3 MIC/Line, 1 AUX, 1 TEL, a built-in Media Player with EQ, as well as Bluetooth source-pairing capability) and an MOH output. In addition, it offers individual phantom power for MIC inputs, volume controls for each input, priority muting, bass and treble controls, and a REC output. Each amplifier works with 70V, 25V, 4-ohm and 8-ohm speaker systems. The Bottom Line: These amplifiers are half the width of conventional amplifiers, allowing two amplifiers to be mounted in a rack side-by-side, increasing inputs, features, and power for the application; or install one now and expand to a second unit anytime in the future without needing additional rack space. They are ideal for installations with limited setup space such as custom equipment racks, lecterns, compact bookshelf audio systems, etc.